November 12, 2015: At least for me, Microsoft made the Windows file search option virtually unusable when they rewrote it for Windows 7. It's a function that I rarely need, but when I do, I don't want to search help or the internet to find how to do it. This week, I finally wrote a FastFileSearch program to find files meeting masking criteria from a selected start folder (e.g. find *permut*.exe to list all permutation related programs in my DFF folder). No content searching yet, but that enhancement is in the wings if I need it. Maybe Windows 10 search will work, but when last I checked ,the Win10 Edge browser did not support add-ons and the Win32Help program could not be installed. Both of those deficiencies are deal breakers for me. Brute Force is our program which solves many algebra based puzzles with integer solutions. It works by exhaustive search over a set of values, trying all combinations in a set of equations. A viewer recently reported having a problem solving this equation set which he described as a "6th grade level algebra problem". Not in my 6th grade! In any event, the program couldn't find a solution with a trial digit range from 1 to 30. That is, until I increased the maximum number of trial digits from 20 to 50. Brute Force Version 3.4.1 posted today implements the change and finds the solution 5 seconds! It now also warns if you specify a range larger than 50 numbers, Sample problem Test50.prb is the problem that uncovered the bug and is included in the downloads. I'm off to try my high school solving skills on this problemJ. 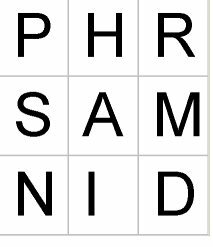 Our "Wordsearch" program allows users or the program to solve those "straight line" or "crooked path" problems. Crooked path problems could not revisit letters within a word, until today. Word Search Version 2.1 adds a "Revisit OK" checkbox to enable solving the recent Mensa Brain Puzzlers Calendar for November 21. Here's the puzzle: Start on a letter and move horizontally, vertically, or diagonally from letter to adjacent letter to spell out a two-word famous fighting force. You may return to a letter and reuse it. All the letters will be used at least once.